Autoimmune conditions affect more than 700 million people around the world and that number continues to rise. In the U.S. 54 million people have been diagnosed with an autoimmune disease. It’s estimated that 22 million have Hashimoto’s thyroiditis. Nearly 80% of those affected with an autoimmune disease are women usually of childbearing age or women under age 65, and the eighth leading cause of death among women. The standard course of conventional treatment is a lifetime of costly medication that come with dangerous side effects. Autoimmune disease is one of the leading cause of morbidity and mortality due to the damaged food and water supply, viral infections, leaky gut, infections (yeast, fungal, Candida, bacterial, parasitic, SIBO and H.pylori), heavy metal toxicity, mycotoxins, toxic chemicals, environmental triggers, and an altered microbiota. The immune system is designed to protect your body from the attack of foreign substances. With autoimmune disease, something goes wrong with the immune system and it attacks and damages healthy cells, tissues, organs and many parts of the body (pancreas, thyroid, skin, kidneys, joints, brain, heart and lungs, digestive system, nerves and blood vessels). 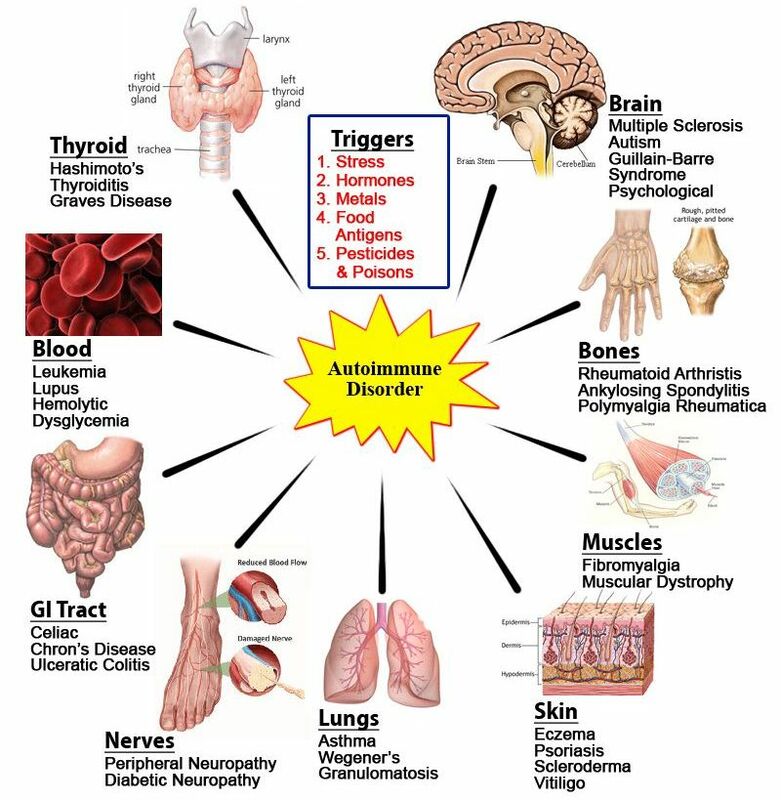 Some of the most common autoimmune diseases include rheumatoid arthritis, lupus, MS, celiac, Hashimoto’s thyroiditis, Sjogren’s, lupus, type one diabetes, psoriasis, Grave’s disease and inflammatory bowel disease, although there are approximately 100 different autoimmune diseases have been identified and numerous additional diseases have been identified of having an autoimmune basis. In normal circumstances cortisol prevents an excess of inflammation and keeps the immune system in check. In many people with autoimmune diseases, this cortisol response and the cascade of brain hormones that stimulates its’ release are impaired, so there is no shutoff valve that stops inflammation when it is no longer needed. In others, the cortisol response may be intact but immune cells are resistant to the anti-inflammatory effects of cortisol due to abnormalities in the cortisol receptor. Many symptoms of fibromyalgia are parallel to symptoms of adrenal dysfunction. Adrenal function must always be factored in for any individual suffering from fibromyalgia, thyroid imbalances, Hashimoto’s, Grave’s and ALL autoimmune diseases. Genetic susceptibility. A person’s genetic makeup may play a role in causing autoimmune diseases or at least make one more susceptible to an autoimmune disorder. A deficiency in one of the immune system’s enzymes can affect the severity of autoimmune diseases. However, it’s important to realize that your genes are not your destiny! Genes are plastic based on environmental epigenetics, which means we can alter which genes are expressed (turned on or turned off) based on environmental and lifestyle choices including what we eat and drink, lifestyle habits such as sleep, stress, exercise, environment, chemical exposure and toxicity, activity level, social circle, behaviors, and even our thoughts, beliefs and level of consciousness! Toxic chemical exposure. Environmental triggers from toxins and chemicals from the air we breathe, the water we drink and bathe in, the food we eat, electromagnetic frequencies (EMFs), obesogens, glyphosate, Teflon, flame retardants, pesticides, herbicides, phthalates, BPA, GMOs, pharmaceutical drugs, dental infections, food additives, toxic heavy metals and more! Researchers at Brown University found that 56% of women aged 16-49 have blood levels of lead, mercury, and PCBs far exceeding the median. Gut dysfunction. Leaky gut. The integrity of the intestinal barrier is a major factor in all autoimmune diseases. There is growing evidence that increased intestinal permeability commonly known as leaky gut syndrome plays a pathogenic role in various autoimmune diseases. Leaky gut, poor absorption, an altered microbiome, gut pathogens, dysbiosis and underlying infections (Candida, viral, fungal, bacterial, mycotoxins, parasites, SIBO and H.pylori) are major root cause triggers that must be tested for and ruled out. Leaky gut can manifest as skin problems such as eczema or psoriasis, autoimmune conditions affecting the thyroid (Hashimoto’s) or joints (rheumatoid arthritis), mental illness, autism, anxiety, depression, and more. All autoimmune disorders have one similarity: an immune response caused by systemic inflammation. Inflammation is connected to almost every known chronic disease — from heart disease to cancer, diabetes to obesity, autism to dementia, and even depression. 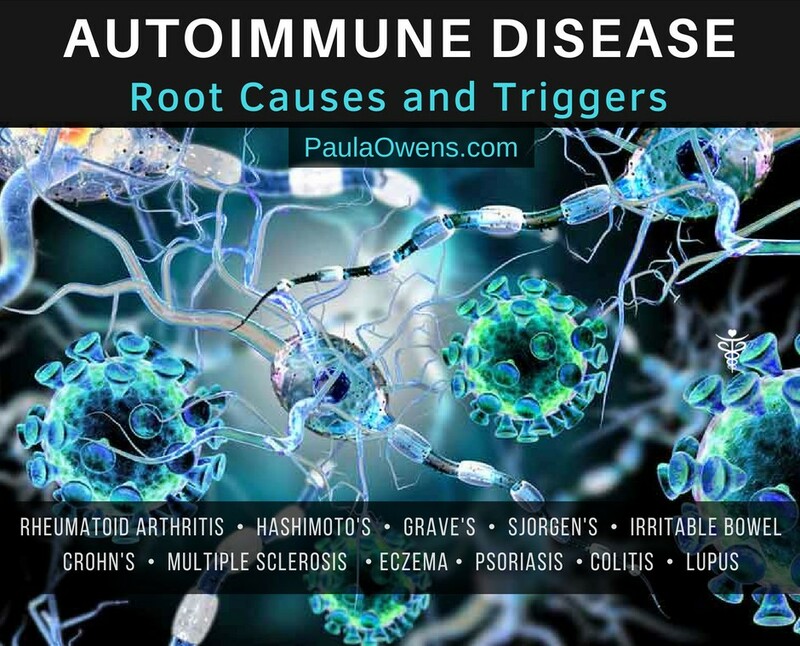 All three of the above autoimmune triggers promote inflammation, deplete the adrenals and cause immune dysfunction to the point that it starts to attack its own tissues. 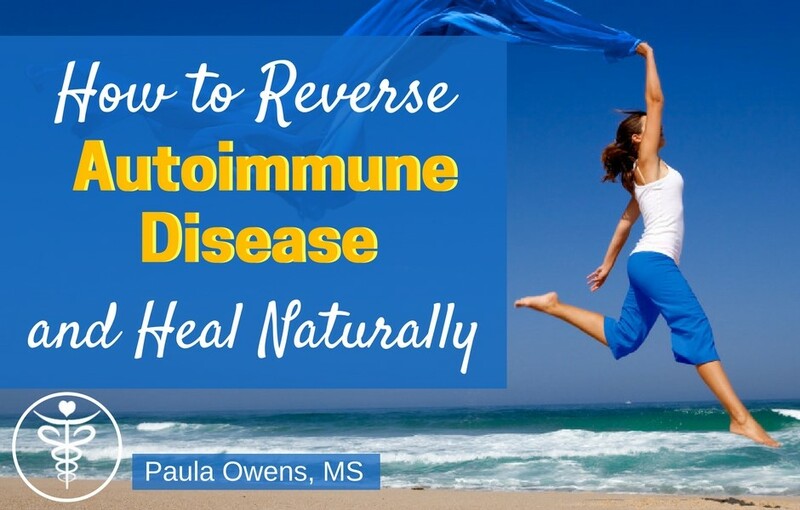 Therefore, it is crucial to identify the underlying root cause of any autoimmune disorder so the healing process and restoration of health can occur. Awareness of the triggering factors can prevent, minimize and even reverse the amount of damage from the autoimmune disease. ♦ Most autoimmune diseases are known to begin or worsen with certain triggers such as viral infections like Epstein-Barr, CMV and hepatitis. Other influences affecting the immune system and autoimmune diseases include mycotoxins, MTHFR genetic defect, toxic overload and detoxification insufficiency, aging, hormone imbalances, pregnancy, adrenal dysfunction and chronic accumulative stress that includes emotional, psychological, physical, electromagnetic, mental, spiritual and environmental stressors. There is a definite relationship between emotional wounds, trauma, toxic relationships and adverse childhood events before the onset of an autoimmune disease. Stress directly affects immune function via neuroendocrine and sympathetic pathways. Consistent activation of those systems cause wear and tear, and breakdown on the body. Emotional trauma, toxic relationships, adverse childhood events (ACEs), early life stress and psychological processes directly impact immune function and can may us sick or make us thrive depending on our response to what is going on internally and externally. ♦ The vast majority of those diagnosed with Hashimoto’s often have either Epstein-Barr virus (EBV), H.pylori or Yesinia pestis. Most are aware that gluten sensitivity, fluoride sensitivity, sodium laurel sulfate, poor gut health, dysbiosis, infections and viruses can be underlying problems with Hashimoto’s, but few of us are aware of H. pylori infections and Yesinia pestis as root cause factors with Hashimoto’s and other autoimmune disorders. Most doctors only treat the symptoms of autoimmune diseases with band-aid medications without ever digging deeper to identify the root cause. Many of the conventional approaches available for autoimmune disease can actually cause one to feel worse. Steroids, Advil, Tylenol, immune suppressants, some antibiotics and TNF-alpha blockers come with harmful side effects including depression, psychosis, osteoporosis, kidney failure, diabetes, intestinal bleeding, even cancer…and the patient never truly heals. Autoimmune disease is skyrocketing, but conventional treatment has very little to offer. Although each autoimmune disease comes with its own symptoms and specific remedies are dependent on each person’s unique biochemistry, the following Natural Remedies are helpful for the majority of all autoimmune disorders. Heal the gut and optimize digestion! Approximately 70-80% of the immune system is in the gut. You may be completely unaware that there is an underlying infection or leaky gut as the root cause of your gut problems, so it’s extremely important to work with a functional health practitioner and identify and rule out any gut dysfunction first and foremost. Identify the root cause of inflammation. This is crucial for healing to occur. As a holistic nutritionist and functional health practitioner with over 25 years of experience, my philosophy is to dig deeper and identify the root cause of Hashimoto’s, rheumatoid arthritis, MS, lupus, Sjogren’s syndrome or any autoimmune disease or any chronic health problem, and determine through functional and clinical lab testing, a thorough and complete lifestyle assessment, a nutritional diagnosis, individual health timeline, emotions and a detailed health history, if there are any specific hormone imbalances, underlying infections, nutrient deficiencies or excesses, digestive issues, toxic load, or deeper health issues. Then, I slowly “peel away the layers of the onion,” and design a healing protocol, diet and nutrition plan, and comprehensive bio-individualized lifestyle plan specific to the individual’s unique biochemistry so they can heal, reverse their autoimmune symptoms, experience vibrant health, balanced hormones, healthy thyroid function, more energy, better sleep, healthy digestion, and look, think and feel better than ever for a lifetime. Heavy metal toxicity, including high iron. Amalgam removal improved the health in approximately 70% of patients with Hashimoto’s according to a 2010 Czech study. Food is medicine! Start by changing the diet: organic, nutrient-dense foods. You cannot and will not heal until you change your diet. A nutritionally-void diet, inflammatory foods and poor nutrition compromises the immune system and increases inflammation. Food is medicine or food is poison. ** Extremely important, especially those with autoimmunity is to identify personal food sensitivities and eliminate inflammatory foods from the diet. You can be eating the healthiest of foods and be completely unaware that certain foods are silently destructing and destroying your health. ** Eliminating nightshades (tomatoes, eggplant, peppers and potatoes) can be very helpful in healing. ** Completely eliminate all gluten, wheat and grains. This means zero gluten. None! Not even a sniff. This is a must for healing and health. There is a significant link between gluten and autoimmune disease. All grains contain mycotoxins. ** Avoid processed soy. A study published in the Journal of the American College of Nutrition documents an association of soy formula feed infants an autoimmune thyroid disease in children. ** Avoid processed sugar, HFCS, lentils and beans, nightshades, dairy, eggs, grains, vegetable oils, corn, and yeast products, including beer. Researchers believe that one of the possible causes of autoimmune ailments is certain foods that are new to humanity that have only appeared in the past 40,000 years. ** Consume plenty of organic fiber-rich non-starchy veggies, leafy greens, low-sugar fruits, organic grass-fed sources of animal protein and healthy fats. Breast Implants? It’s important to consider the possible link between autoimmune disease, the body rejecting the breast implants, and the impact of a foreign toxic plastic object in the body and the problems it can pose. Restore Immune and Mitochondrial Function. Although each individual has their unique set of needs, restoring mitochondrial impairment, restoring healthy immune function and limiting immune suppressors play major therapeutic roles in healing. Practice parasympathetic activities and some form of deep relaxation every day such as meditation, walking outdoors in nature, restorative and yin yoga, deep diaphragmatic breathing exercises, massage, aromatherapy and more time in nature. Strengthen vagal tone. Unmanaged stress worsens the immune response and intensifies symptoms making them worse. Thoughts, unresolved emotions and feelings have a direct impact on the immune system. Adverse childhood events, unresolved trauma and repressed emotions such as worry, grief, frustration, guilt, anger and resentment have a huge impact on our overall health, and can affect certain organs such as the liver and gallbladder, kidneys, spleen, heart and lungs resulting in digestion problems, insomnia, headaches, a weakened immune system, hormone disruption, excess weight and many other health problems. When you ‘do your work’ to delve deeper into these unresolved emotions and mental patterns, it’s as though a heavy load has been lifted and health problems magically dissipate. Releasing emotions that no longer serve us in a positive light is essential to experience our highest level of health and live happy, healthy vibrant lives. Some helpful exercises to do this include writing or journaling; meditation; Qi Gong; getting rid of clutter and old items; 12 steps of forgiveness; tears; gratitude and appreciation log; spending time outdoors connecting with nature; flower essences; the “I AM” A-Z Exercise; listening to your internal guidance and trusting your intuition at the soul level. Laughter, community, journaling and feelings of happiness increase and enhance the actions of our immune cells. Surround yourself with people that support you and make you feel good, and avoid low vibration, energy vampires. If you’re overweight, take steps to lose weight. Extra body fat increases the risk of autoimmune disease. Follow the principles found in The Power of 4 and Fat Loss Revolution. Identify your personal nutrient deficiencies through a functional blood chemistry analysis or micronutrient test. Balance body chemistry with basic nutrient support and supplement with high-quality nutrients only. Move your body every day. Engage in resistance training at least 2x per week that works the major muscle groups. Balance sympathetic activities with parasympathetic activities. Follow the 12-week program found in Fat Loss Revolution. Daily walking outdoors. Practice yoga. Get out in nature. Consider EFT (Emotional Freedom Technique). Read more about EFT in The Power of 4. Sunshine exposure for at least 20-30 minutes daily is highly beneficial for the immune system, resetting the natural circadian rhythm, and stimulating vitamin D production. However, too much sunlight can act as a trigger for some autoimmune disorders and can actually make symptoms worse. Sleep matters! Prioritize 7-9 hours of restful, uninterrupted sleep in a pitch dark room every night. Always charge your cell phone in a room other than your bedroom. Unplug the WiFi and all electrical devices in your bedroom.